In just four weeks, sales and marketing professionals from all over the world will be descending upon Boston for HubSpot’s Inbound 2016 conference. I can’t wait! This will be my third Inbound. My first Inbound was in 2014. I was lucky enough to win a ticket to attend and it was, by far, the best experience I have ever had at a conference. I left inspired and motivated to make marketing what I always knew it could be. I loved it so much that in 2015 I dragged a former co-worker with me. She also was impacted by the conference and returned ready to steer her organization down a new path. When I won that ticket back in 2014, my marketing-life was at a crossroads. I knew that the approach I was used to was not as effective as it was in the past. As I searched for answers to the issues that were plaguing the company I was with at the time, I began to learn about the inbound philosophy. In my search, I came across information about Inbound 2014 and I knew immediately that I needed to attend and I found a way. If you have the opportunity to go, take it! You won’t regret it. If the testimonial I’ve already provided hasn’t convinced you, here are eight more reasons you should attend. With more than 300 break-out sessions on seven different tracks, it’s hard not to learn something new at Inbound. Whether you’re an executive looking for leadership sessions or a new HubSpot user just trying to figure out how to use the tool, there are sessions for you. When I left Inbound 2014, I had a notebook full of things I had learned. Some of it was technology related, some was skills-oriented and a lot of it related to tips and tricks to help me be more efficient. I still refer to that notebook today. While I did learn a lot in 2015, it wasn’t as easy to get into the sessions that I was really looking forward to attending. Many of the sessions filled up and I often had to go to my second or third choice. To help alleviate that problem, HubSpot made a change this year. Attendees will now register ahead of time for breakout sessions. If there are sessions you know you don’t want to miss, make sure you register as soon as they let you know you can. You will not find another opportunity to learn from such a wide variety of experts in sales, marketing, leadership and the technology that keeps it all going. HOT TIP: This year, Imagine's Doug Davidoff will again be presenting at Inbound. His presentation, Bridging the Sales and Marketing Divide: Using Sales Enablement Strategies to Create Predictable and Scalable Revenue Growth, will be held on Thursday, November 10 at 11:45am. Doug will talk about the role sales enablement plays in growth-driven organizations and how you can start using the strategies more effectively. What better reason could there be to attend? As a marketer, I have often felt like an outsider within my own organizations. Many times the role of marketing is misunderstood and the real work we do is minimized by others. The second I walked in to Inbound in 2014, I felt at home and totally understood. There’s something about being with 10,000+ like-minded individuals to really boost your confidence. The first keynote I attended was Simon Sinek. From that moment forward, I was 100% certain I was in the right place. During the week, I met many new people and learned that their marketing challenges were similar to mine. It was fun to meet them and learn from them. Inbound is designed for networking. Happy hours and social events are built into the schedule. In general, people are friendly and just as anxious to meet new people as you are. Who knows…you may meet someone that turns into your next employee, your boss or your friend. Inbound marketing is tough. It’s a never-ending list of to do items and another list of things to figure out. Sometimes you just need a break. 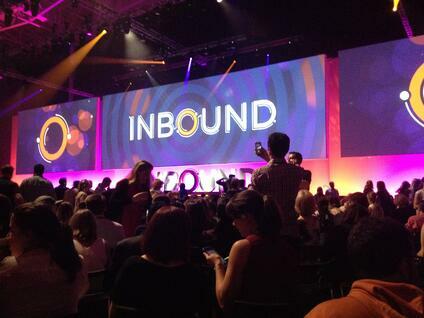 Inbound is energizing. Attending the sessions reminds you why you got into marketing or sales in the first place. Something you learn may re-ignite your passion and make a real difference in your future. One of my favorite tracks the last two years was Bold Talks. HubSpot invites speakers with inspirational stories to tell about how they were able to overcome extreme obstacles or build something from nothing. The lessons that can be learned from those speakers go way beyond your professional life. They can be applied to your whole life. Who knows, there could be a bold talk that changes you forever. Last year, there was a lot of laughing at Inbound. Amy Schumer headlined the Inbound Rocks event – need I say more? Additionally, Aziz Ansari gave a keynote address that was also very entertaining. I’m sure this year will have its share of laughs too with Sarah Silverman and Alec Baldwin on the schedule. Remember, research has shown that laughter can reduce stress and increase immunity. Inbound might be just what the doctor ordered. I’m sure there are people out there that don’t think food trucks are such a big deal. For me, they are. Where I live, we really don’t have food trucks. The novelty of walking outside the convention center and choosing from 20+ food trucks is…well…fun! Three days at Inbound means three chances to try something from a Boston food truck that you may never have the chance to try again. Standing in line also provides another opportunity for networking. I know I met several people the last two years waiting for my lunch. While it may not be your number one reason to attend, it does add a unique quality to the event. My first Inbound was also the first time I had ever visited Boston. I’ll be honest. As I was putting my trip together, Boston was intimidating. It’s a huge city. Every year, I say I’m going to add days on the next year so I can see more of the city. While that hasn’t happened yet, it is something I will definitely do in the future. If none of my other reasons have swayed you to attend, maybe this one will. Inbound is fun…a little overwhelming but fun. And sometimes a little fun can go a long way in reminding you why you do what you do. Take the time to have fun. Your team, your employees, your family and friends will all thank you.